Mothers, they give all of the time with their time, energies, love, talents, gifts, the list goes on and on. With all of the gifts they give to others, they can only hope that some of them will actually make a difference in the life of someone else. In the case of Melissa Kohlman, West Orange Mom and Seton Hall University Math and Science Department Secretary, she won’t ever have to wonder. Recently, she gave the best gift of all to a stranger in need, the gift of life. It happened when she became a living kidney donor, donating to someone who desperately needed it. In an ironic twist, that recipient was someone dedicated to helping others at the worst times of their lives, North Hudson Firefighter, Robbo Pisani. Pisani has been battling end-stage renal failure since January 2017. The surgery was held at St Barnabas Medical Center in Livingston on Nov 7th. Sometimes there are moments in life where things or decisions become crystal clear, something that points people in a particular direction. They are often referred to as Godwink moments. These moments can happen any time, in the course of daily lives, even on a routine commute home. Kohlman states that the decision to be an organ donor for Pisani was one of these kinds of moments. 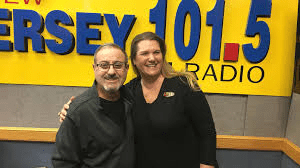 She shares that she first heard about Pisani and his situation back in July when she was driving home during her routine seven minute drive home, listening to her usual radio station, NJ 101.5, and usual evening radio show host Steve Trevelise. When she heard the emotional way Trevelise was talking about Pisani, “his oldest and dearest friend,“ and his battle with kidney failure, Kohlman was so affected, that she felt like she had to do something. That something was to volunteer to be a living donor for Pisani’s kidney transplant. In the United States alone, approximately a staggering 100,000 people are in need of a kidney transplant. While many people wait from 5 to 10 years for a kidney from a deceased donor, the chances of living donation are much higher. Long term survival is vastly improved for patients who receive a donor kidney compared to those who remain on dialysis. For Kohlman, there was no choice. “When I heard the host talking, I got such an odd feeling. Without sounding crazy, I knew right away, I was going to donate a kidney to this man. It was a feeling that was nagging and consuming me. It was what my mind and body was telling me to do,” she remarks. She even called in to the radio show saying she’d donate a kidney. After the hospital discerned that their blood types matched, and Kohlman underwent numerous, subsequent medical tests, the surgery was a go. “I was just like, ‘I knew it!’” Kohlman enthuses. When asked how she is feeling, Kohlman says she is feeling fine, and she shares that Pisani is feeling “great,” and she proudly relates that the firefighter is off dialysis now and is slated to even go back to work in February. With that one Godwink decision, Kohlman received so many great things including a new friend in Pisani and the chance to make a difference. “I’m so proud to be a donor, to improve somebody’s life, and to help someone,” she shares.